The CEED (common entrance examination for design) is an All India Examination conducted by the IIT Bombay, on behalf of the Ministry of Human resources Development, Government of India which is used to assess the candidate’s aptitude for design, creativity, visual perception skills, design skills, drawing skills, logical reasoning and communication skills. The CEED examination is divided in to two parts, Part A and Part B. The two parts of the test are followed by the interview process. The CEED examination is designed to test the skills of the candidates who aspire to study the design programmes at recognised institutes in India and enter into the design industry. The various design programmes are listed in both post graduate and PhD programmes at the most recognised institutions in India such as Indian Institute of Technology Bombay. Let us see the complete list of the CEED institutes where the design programmes are provided to the aspiring candidates. These institutions provide the various world class design programmes which are exclusively for the candidates aspiring for the design programmes as postgraduate programmes. The PhD programmes involved in the design programmes are available in the following institutions. The design programmes available with the above mentioned institutions are given below. 1. The Indian Institute of Science, Bangalore is offering the Master’s programme in Product Design and Engineering. 2. The Indian Institute of Technology, Bombay is offering master’s programme in Industrial design, Visual communication, Animation, Interaction design and the Mobility and vehicle design. 3. The Indian Institute of Technology, Delhi is offering master’s programme in Industrial design. 4. The Indian institute of Technology, Kanpur is offering master’s programme in Design (M.Des). 5. The IIITDM, Jabalpur is offering the CEED examination selected candidates to study the Master’s programme in Product Design and Engineering. The UPES, Jabalpur is offering the CEED selected candidates to study the programme in Industrial design, Interaction design, Product design and transportation design. The PhD programmes offered for the candidates who are CEED selected are in the field of design research. The PhD programmes usually provide many research themes and assist the PhD scholars with the various intricate fields of the research theme of design and related fields of design engineering. 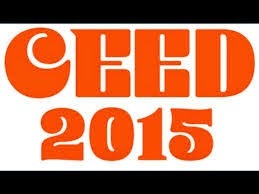 Kindly post your replay for "CEED Institutes & Programmes"